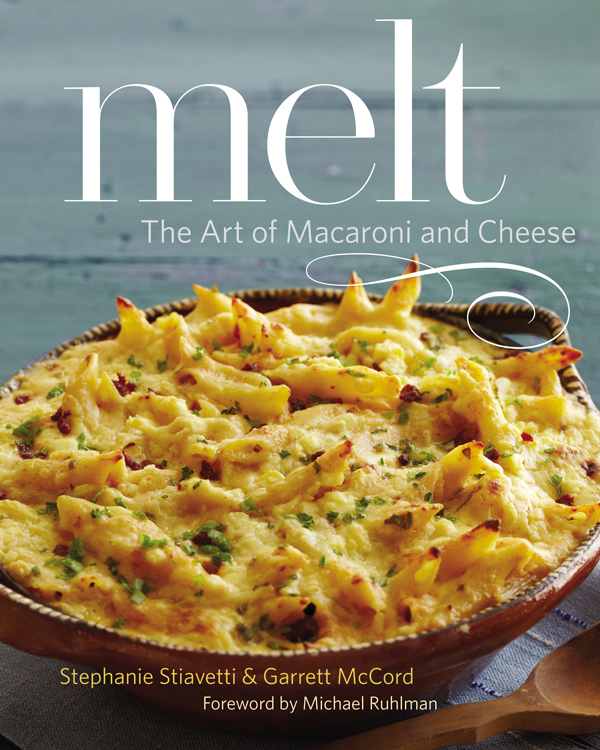 Just in time for cooler fall climes, there’s a new book called Melt: The Art of Macaroni and Cheese. Local northern California food writers and BAB bloggers Stephanie Stiavetti and Garrett McCord have developed new takes on the classic comfort food and their innovative creations tempt and excite. The duo has also achieved expert status on how to shop for and cook with cheese. 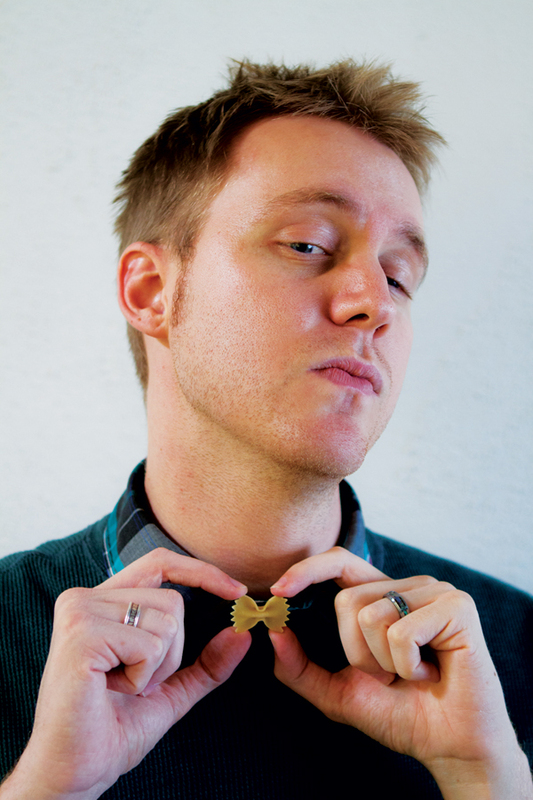 Bay Area Bites caught up with the authors to discuss their newly published book. Their comments have been edited for clarity. Bay Area Bites: Melt asks folks to take something we think we know – pasta and cheese — and consider making it with different ingredients to go beyond the comfy mac and cheese casserole. What are some of your key recipes? McCord: I think one of the recipes I personally dig that shows a unique spin on the subject is our beet and Roquefort mac with poppy seeds. It's got a 90s grunge, Pretty In Pink, guy-liner thing going for it appearance-wise with the beet-mornay sauce. Plus, Roquefort sauces are somewhat unique. It gives the mornay some serious blue bite in all that magenta-hued deliciousness. Stiavetti: Even though we’re madly in love with uber-thick, creamy macaroni dishes, we really tried to expand our thinking outside of the standard cheesy-mac. The salad chapter is filled with non-standard macaroni and cheese recipes, my favorite being the Humboldt Fog, Grilled Peaches, and Orzo. We even hopped over into dessert territory, where another one my favorite dishes lives: a decadent cannelloni stuffed with fromage blanc and chevre, drizzled with a creamy peach topping that is given a touch of heat by the merest pinch of ghost pepper. Bay Area Bites: Fall is upon us, and almost the perfect season to launch a book that incorporates melted cheese at its ooey gooey best. What are some recipes that take advantage of our farmers’ market scene for fall? 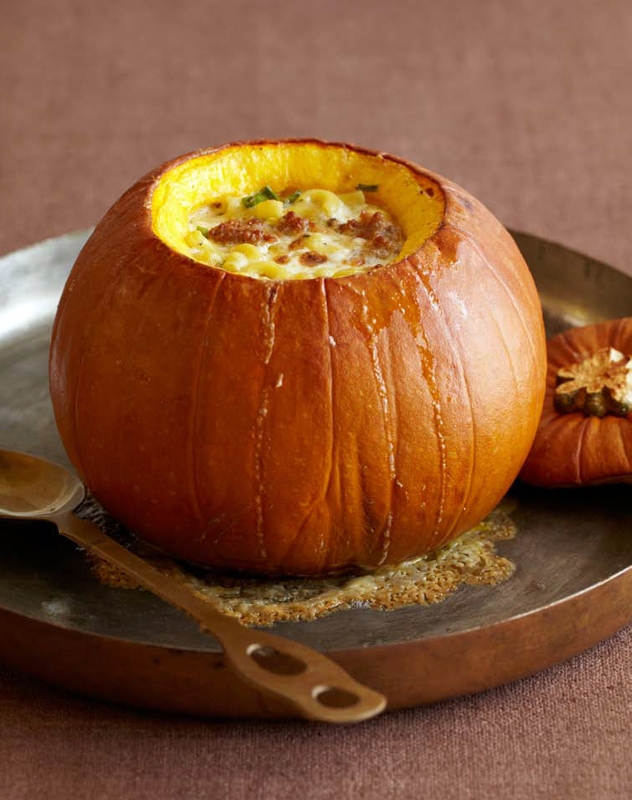 McCord: The stuffed pumpkin is definitely a perfect recipe for Autumn – take a sugar pumpkin, hollow it out, pre-bake it, and then you fill it with sausage, cheese, pasta, and cream. It’s got show for sure, but the taste when the cream becomes infused with the flavor of roasted pumpkin? It’s more wonderful than a stampede of corgis. There’s also a salad recipe using persimmons and Fiscalini cheddar that’s easy to make and hits every note on the tongue; sweet, fruity, sour, it’s all there and really quite satisfying. Plus, it let me put one of my favorite fruits in the book! Stiavetti: Hands down, the Kasëspätzle reigns supreme as my favorite fall dish. It’s so simple to create but yields a seriously impressive tangle of tender, homemade dumplings smothered with melted Edam cheese. To top off this recipe, we caramelize a few super-sweet onions that you’ll see popping up at the farmers' market. Making this dish is like a big, old culinary bear hug: creamy, hearty, and bursting with flavor. Bay Area Bites: What are some tips for making and eating macaroni and cheese? McCord: Pre-heat your milk on the stovetop first if you plan to make a mornay. Seriously, using cold milk will slow down the process to a crawl. Warming speeds things up significantly by about 10 minutes. Stiavetti: Turn off the heat on your béchamel before adding the grated cheese! Heating cheese too fast can cause the liquids and solids to separate, which makes for a very sad sauce indeed. We make a note in every recipe to remove the pot from the heat before adding the cheese, but I always make sure to mention it so people know that it’s an important step. Bay Area Bites: You are both cheese experts at this point. Where do you buy and eat cheese? McCord: Stephanie introduced me to The Pasta Shop in Berkeley, and now when I go to visit her from Sac I always end up making a quick stop there. Stiavetti: I love The Pasta Shop in Oakland and Berkeley, and I’m a frequent visitor to The Cheese Board (of course) and an awesome new shop that just popped up in Oakland a few years ago called Sacred Wheel. It was opened by a local cheese lover named Jena; she’s incredibly knowledgeable and passionate about cheese. And her kitchen serves up some gorgeous hot dishes made from the cheeses she sells at the counter! Melt Book Tour Information: View local book events. Pumpkin Stuffed with Fontina, Italian sausage and macaroni. Fontina is a creamy, woodsy, Alpine-style cheese. There are many varieties of Fontina, from Swiss to Italian, with some fine specimens even coming out of Wisconsin. Each has its own unique profile, so be sure to taste them all and pick the one that you like best. Regardless of which you choose, you will get a nice, semi-hard texture and subtle mushroomy flavor. It just so happens that Fontina pairs beautifully with the sugary flavors of a good baking pumpkin. This recipe, baked inside the pumpkin—a trick inspired by Dorie Greenspan and Ruth Reichl, both famous for their stuffed-pumpkin recipes (among other things)—simply knocked our socks off with flavor and a stylish yet homey presentation. Although best with Fontina (and a touch of Gruyere, another Alpine favorite), this recipe is flexible and can use whatever cheeses, meats, onions, or extra pasta you have on hand. Feel free to experiment. 1. Preheat the oven to 350°F. Cut a circle from the top of the pumpkin at a 45-degree angle, the way you would cut open a pumpkin to make a jack-o’-lantern, and set aside. Scoop out the seeds and strings as best you can. Generously salt and pepper the inside of the pumpkin, pop the top back on it, place it on a rimmed baking dish (since the pumpkin may leak or weep a bit), and bake for 45 minutes. 2. Meanwhile, heat the olive oil in a sauté pan over medium heat. If the sausages are in their casings, remove the meat and discard the casings. Crumble the sausage meat into small chunks and cook until lightly browned. Remove the sausage from the pan with a slotted spoon and set aside to cool. Discard the drippings, or save for gravy. 3. Also while the pumpkin bakes, cook the pasta in a large pot of salted boiling water until al dente. Drain through a colander and rinse with cool water to stop the cooking process. 4. In a bowl, toss together the Fontina, Gruyère, sausage, pasta, scallions, and herbs. Once the pumpkin is done baking, take it out of the oven and fill it with the macaroni and cheese. Pour the cream over the filling. Place the top back on the pumpkin and bake for 1 hour, taking the top off for the last 15 minutes so the cheese on top of the filling can properly brown. If the top cream still seems a bit too wobbly and liquid, give it another 10 minutes in the oven. The cream may bubble over a bit, which is fine. If the pumpkin splits while baking, as occasionally happens, be thankful you set it in a rimmed baking dish and continue to bake as normal. 5. Allow the pumpkin to rest for 10 minutes before serving. Be careful moving the dish, as the pumpkin may be fragile. You can serve this dish two ways: Cut it into sections and serve them, or just scoop out the insides with scrapings of the pumpkin flesh for each serving. Either way is just dandy. Salt and pepper to taste. Alternative cheeses: Fontina and Gruyère are widely available and are best used for this recipe, but feel free to try your favorite cheese. We particularly like Valley Ford’s Estero Gold or its Highway 1 Fontina, as well as Roth Käse’s MezzaLuna Fontina. If you want to try something radical, a creamy blue cheese like Buttermilk Blue or Cambozola will do nicely too.